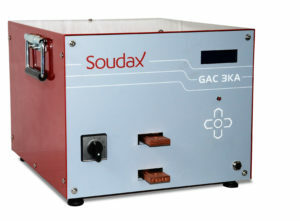 The GAC range can be used for welding and braze welding requiring long welding times. With 30 welding programs and a simple programming system, this AC generator is robust and easy to use. 10 welding steps (docking, six welding steps, forging). Single, sequencer*, repated* and seam* modes.